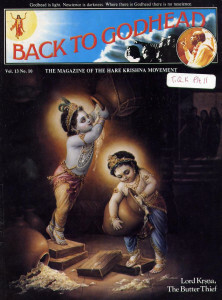 Each month the Bhaktivedanta Book Trust (publisher of BACK TO GODHEAD) distributes well over one million magazines and books. Here are a few letters from readers. Last night I had a most fortunate experience. I was approached by one of your devotees, and he gave me a copy of BACK TO GODHEAD. I found your magazine to be both highly inspiring and profoundly beautiful. It is because of this that I have enclosed a check for a subscription. Thanks. I am a fourteen-year-old student at boarding school who felt an emptiness until I found Lord Krsna. A young man sold me one of your beautiful books for a very reasonable price, and so, being bored, I read it. I agree wholeheartedly with all I read in the book, and I wish I could learn more. You may consider me too young to believe, but I truly find this a wonderful discovery. Your advice concerning chanting the Krsna mantra seems very reasonable. After reading the latest issue of BACK TO GODHEAD, I have added the Krsna mantra to my other devotional activities. I work all night at my police department and have a fine opportunity to chant. I think that meditation has added greatly to the benefits that I derive from attendance at daily Mass at my parish church. I have also visited the Miami branch of ISKCON and made friends with some wonderful devotees. My daily duties had been a fight for me, especially because one of my children, Michael, is severely afflicted with cerebral palsy. The nectar that ISKCON offers has helped me greatly. BACK TO GODHEAD helps me face each new day with additional hope. About six months ago a friend of mine gave me the Bhagavad-gita As It Is. I was immediately drawn to it. I read it through rather quickly, and I was overwhelmed by its meaning in my life. I then started reading it thoroughly. I found that my life was indeed changing. I have never completely known this feeling before, this feeling of true peace and security. I can see things now as I never saw them before. I wish I could tell you how Bhagavad-gita has filled the void in my life, but I would grow old writing. I have just completed reading Bhagavad-gita As It Is and was deeply moved by it. My wife and I have been studying yoga for nearly two years now, and it was not until we read Swami Bhaktivedanta’s translation of the Gita that we began to feel something happening in our lives. I was raised through my childhood by the beliefs of the Catholic Church, but I never really understood and realized God as I have through the teachings of His Divine Grace A.C. Bhaktivedanta Swami Prabhupada. The past few years I have been very confused in trying to find my purpose in life, but through meditation and reading the Bible I was beginning to feel a purpose in God realization. However, I was always backsliding to the materialistic world. I believe the teachings of the Srimad-Bhagavatam and those of the Bible are striving for the same goal of teaching the path of spiritual realization through God, although I understand the Srimad-Bhagavatam because it is more clearly presented. I have found out about Hare Krsna. I would like to know more. I know little English. You have books in Japanese. Please send me all you have. Krsna very beautiful. I would like to know more about Krsna. Over a year ago, the book Srimad-Bhagavatam was given to me as a gift. In just the last two weeks, I have really sat down and studied this book, and I love it. As I read, a peaceful, good feeling seems to overtake me, and I can’t concentrate on my everyday problems. I love it! I feel I’ve been deluded most of my life, living for false ideals and impossible goals. I buy things and do things not because I want or need to, but because I’ve been pressured and conditioned to accept it. I as an individual have no real goal or purpose in life. Sometimes I would mentally set myself apart from the world to observe it impartially. All I would see were people wandering aimlessly about, with as much purpose as rats in a maze. Then the question arises, why do I exist and what purpose do I serve? The Bible tells us man was meant to serve God, but doesn’t explain who or what God is or even how to serve Him. I think Srila Prabhupada has answered these questions quite thoroughly and honestly, leaving absolutely no room for doubt in my mind—Krsna’s the answer. Sometimes I think of life as traveling through a dark tunnel, hoping to catch a glimpse of the light at the far end. Some people never see that light, but live and die in darkness. But, through the good fortune of meeting a devotee one afternoon and receiving from him a copy of, BACK TO GODHEAD magazine and the opportunity to read several of Srila Prabhupada’s books, I feel I now have a chance to reach Krsna and achieve the real goal of life.